KABUL, Afghanistan Opium poppy cultivation in Afghanistan has been increasing for a third year in a row and is heading for a record high, the U.N. said in a report released Monday. The boom in poppy cultivation is at its most pronounced in the Taliban's heartland in the south, the report showed, especially in regions where troops of the U.S.-led coalition have been withdrawn or are in the process of departing. The report suggests that whatever international efforts have been made to wean local farmers off the crop, they are having little success. Increased production has been driven by unusually high opium prices, but more cultivation of Afghanistan's premier cash crop is also an indication that Afghans are turning to illicit markets and crops as the real economy shrinks ahead of the expected withdrawal of foreign combat troops at the end of 2014. Afghanistan is the world's largest producer of opium, the raw ingredient in heroin, and last year provided about 75 percent of the global crop  a figure that may jump to 90 percent this year due to increased cultivation. Crop sales mostly fund local power brokers and criminal gangs in Afghanistan and to a lesser degree the Taliban, Western experts believe. This makes it difficult for the Afghan government to establish control in areas where the economy is driven by black-market opium sales, despite a small but effective counternarcotics force. "As we have predicted, opium will go up for a third year in a row," said Jean-Luc Lemahieu, head of the U.N. Office on Drugs and Crime in Afghanistan, which prepared the report along with the Afghan Counternarcotics Ministry. "We are looking at a record high cultivation." The Afghanistan Opium Winter Risk Assessment 2013 issued by the United Nations Office on Drugs and Crime was conducted in two phases. One from December to January for central, eastern, southern and western Afghanistan, where opium was sown in the fall of 2012, and another in February and March that covered northern and northeastern Afghanistan, where opium is usually planted in the spring. The exact figure for 2013 is still unclear, but the U.N. said that indications are it will surpass the 154,000 hectares planted in 2012, and the 131,000 in 2011. The report attributed the increase to the high sales price of opium, which has made cultivation attractive to farmers. Although prices were lower than the three previous years they "were still at a higher level than between 2005 and 2009, making opium cultivation very attractive to farmers." Fear of eradication was the main reason cited by those farmers who decided not to cultivate the crop. Prices started spiking in 2010, when blight killed much of the crop. They went from about $60 to $85 a kilogram (2.2 pounds) to $300 in 2011. Although prices this year range from $160 to $200, they are still very high. "This price is not explainable," Lemahieu said. "Demand in the region and globally is even. There is no demand increase to explain this." Afghan heroin makes its way to regional countries, Europe and Russia. The report found that poppy cultivation trends indicate that of Afghanistan's 34 provinces, an increase was predicted in 12, no major change in seven and a decrease in one. A total of 14 were expected to remain poppy free. Two of the provinces, southern Kandahar and Helmand, expect "high" and "very high" cultivation levels. They are the two provinces where the U.S.-led coalition is withdrawing troops after focusing forces during a three year surge that ended last year. They were also two of the provinces where great emphasis was placed on finding alternative crops for farmers. "The southern region is expected to remain the largest opium cultivating region in Afghanistan in 2013. 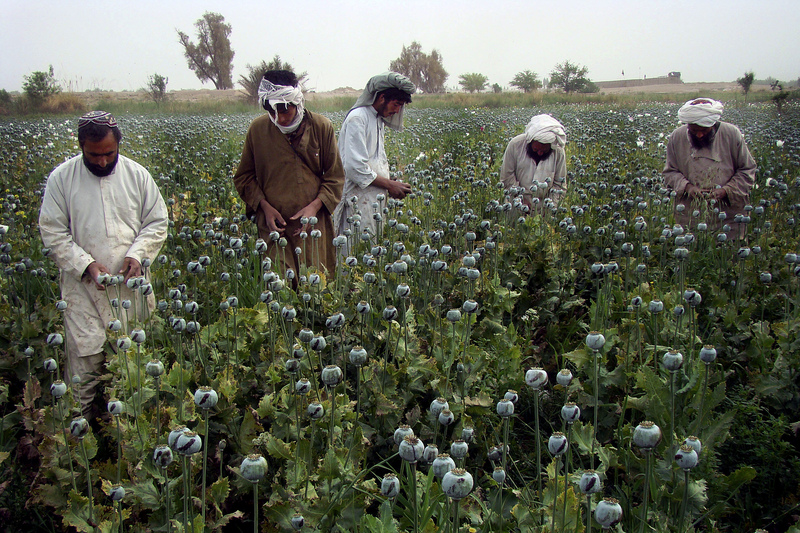 Poppy cultivation in Helmand and Kandahar, the main opium cultivating provinces in the country, is expected to increase and Helmand is expected to retain its status as the largest opium cultivating province in the country," the report said. Illicit cultivation and production of opium poppy was thought to make up about 15 percent of Afghanistan's Gross Domestic Product, which in 2012 stood at about $20 billion. It is unclear what percentage it will be this year and it also remains unclear if poppy cultivation will increase further to make up for any shortfalls in the real economy. Much of Afghanistan's GDP is funded by foreign investment and the country's real economy is expected to shrink after 2014, when foreign troops leave the country and international investment in the country drops. Afghanistan's international donors have agreed to provide the country with about $4 billion in annual funding for a few years after 2014, and the U.S. and some troop-contributing nations have pledged to also pay about $4 billion for the Afghan National Security Forces during the same period.